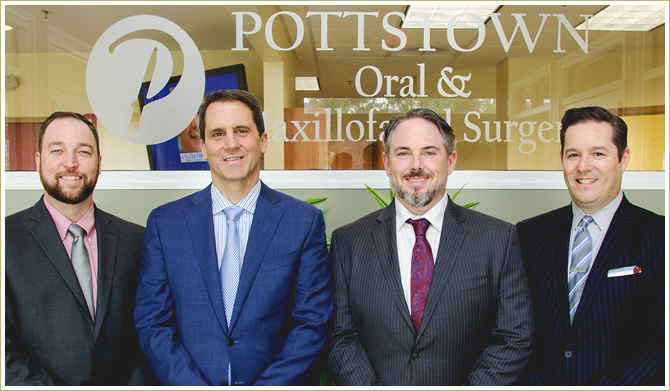 Our physicians Dr. Smith, Dr. Lignelli, II, Dr. Ward, and Dr. Roland at Pottstown Oral Surgery practice a full scope of oral and maxillofacial surgery with expertise in dental implants, wisdom teeth, bone grafting, and more. As oral and maxillofacial surgeons we manage a wide variety of problems relating to the mouth, teeth and facial regions. All procedures performed at our office can be done under general or local anesthesia. Our techniques are designed to rebuild bone structure with minimal surgical intervention and optimal patient comfort. We can also diagnose and treat facial pain, facial injuries, fractures, and various types of head and neck pathology. Learn more about the oral and maxillofacial services that we provide. Our Patient Information page provides more information about our policies, procedures, and insurances accepted. We have two offices located in Pottstown, PA and Boyertown, PA. To schedule an appointment you can contact us at 610-326-7880, or Request an Appointment online. And to save time during your first visit, you can complete submit our Online Patient Registration Form. Thank you for visiting our website and we look foward to seeing you at our Pottstown or Boyertown office soon. Our physicians Dr. Smith, Dr. Lignelli, II, Dr. Ward, and Dr. Roland at Pottstown Oral Surgery practice a full scope of oral and maxillofacial surgery with expertise ranging from dental implant surgery and wisdom tooth removal to corrective jaw and temporomandibular joint surgery. As oral and maxillofacial surgeons we manage a wide variety of problems relating to the mouth, teeth and facial regions. Why Choose Pottstown Oral Surgery? All of our physicians are certified by the American Board of Oral and Maxillofacial Surgery. All the procedures performed at the office can be done under general or local anesthesia. A state of the art facility. Our techniques are designed to rebuild bone structure with minimal surgical intervention and optimal patient comfort. We can also diagnose and treat facial pain, facial injuries, fractures, and various types of head and neck pathology. Our staff is trained in assisting with Intravenous (IV) sedation or outpatient general anesthesia in our state-of-the-art office setting. A physician is available 24 hours a day, seven days a week, even at night, weekends, or holidays, to handle any emergencies of patients of Pottstown Oral Surgery. Dr. Smith is from Mt. Carmel, PA. He attended Muhlenberg College in Allentown, PA and following graduation attended University of Pennsylvania School of Dental Medicine. Dr. Smith completed a Four-year residency in Oral and Maxillofacial Surgery at Washington University and St. John’s Mercy Medical Center in St. Louis, MO. Dr. Smith then entered private practice in 1990 with Pottstown Oral and Maxillofacial Surgery. Dr. Smith is certified by the American Board of Oral and Maxillofacial and the National Board of Dental Anesthesia. Dr. Smith presently serves as an examiner for the American Board of Oral and Maxillofacial Surgery. Dr. John Louis Lignelli, II DMD was born in Pottstown, PA. He attended The University of New Hampshire in Durham, NH and following graduation he attended Temple University School of Dentistry. After earning his DMD degree, Dr. Lignelli completed a residency in Oral and Maxillofacial Surgery at Temple University Hospital in Philadelphia, PA. Dr Lignelli then entered into private practice in July of 2007. He is board certified by the American Board of Oral and Maxillofacial Surgery. Dr. Ward obtained his B.S. degree from Ursinus College in 2000 and his DMD degree from Temple University School of Dentistry in 2004. While at Temple, Dr. Ward received several awards including the Howard Carson award for excellence in oral surgery and the Martin N. Kravitz D.D.S. Class of 1944 award for clinical excellence. Dr. Ward completed his training in Oral and Maxillofacial Surgery at Temple Hospital from 2004 to 2008 and served as chief resident from 2007-2008. He is board certified by the American Board of Oral and Maxillofacial Surgery and is a member of local, regional and national oral surgery and dental associations. Dr. Donald Roland graduated from King's College in Wilkes-Barre. Dr. Roland earned his DMD degree from Temple University School of Dentistry and his MD from Drexel University College of Medicine. Following graduation from dental school Dr. Roland completed a six-year residency in Oral and Maxillofacial surgery at Drexel University College of Medicine. He is board certified by the American Board of Oral and Maxillofacial Surgery. View all of our videos at our Videos Page or our YouTube Channel.